I don't know about you, but I certainly feel more productive and creative when I'm working in a team. Perhaps it's my short attention span or my preference for chatting through a problem rather than facing it on my own, I value team work and feel very fortunate to have a fantastic team around me at Mace. It's good to see that the science backs up my personal experiences. The studies from the University of Virginia and anecdotal evidence from Google and WeWork in the article linked below support the view that human to human interaction help to stimulate our brains and improve our productivity. 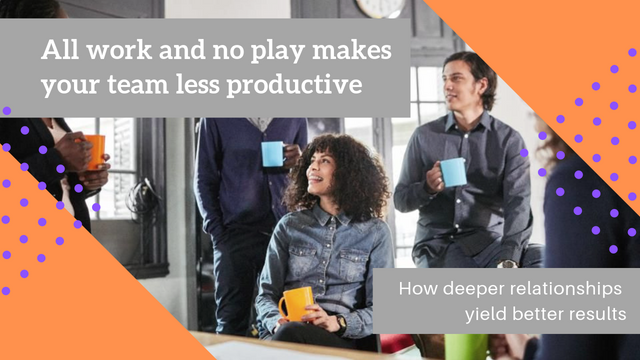 The question is, how do you balance the need for interaction with the equally important requirement for people to have a quiet work environment where they can focus on tasks and avoid distraction? As a leader you've got to find the right balance for your team, and recognise that everyone will work differently and need different levels of quiet focus and social interaction. We need to find the right mix of formal and informal intervention to get teams to gel. Formal interventions can be effective in addressing specific challenges; off-site workshops or coaching can be targeted at issues and problems your team is facing. Done badly and they're as cringeworthy as an episode of The Office, but done the right way they're a fantastic way to get the team together and on the same page when facing a challenge. I think however that we shouldn't downplay the importance of informal interactions. Whether it's the design of the office to facilitate a quick discussion over a coffee, the using lunches and drinks to get the team to discuss something other than the impending deadline they're facing, or allowing people time to get to know one another and find their own natural rhythm with their team, informal interactions are often more natural and are more easily accepted by teams. James Coan, a neuroscientist from University of Virginia, suggests that our brains rely on relationships to steer our cognitive energy and focus our attention on shared goals -- critical elements of team success.